Be Efficient And Resilient or BEAR, is this year’s theme for Energy Exchange 2019 (#EnergyExchange2019), the largest agency-driven training event for the federal energy management community. Coming to Denver’s Colorado Convention Center, August 20-22, the Energy Exchange is designed to support agency goals, mission readiness, and workforce development. When we think about the symbolism associated with the word bear, it’s often linked to courage, strength, and leadership. These traits also describe those who work in the federal energy management community. Those who attend Energy Exchange 2019 will hear from senior agency management, speak with proven solution providers, and benefit from this premiere training event. Training content focuses on the integrated aspects of ensuring efficient and mission-ready federal operations. Attendees are presented with multiple opportunities to explore advanced technologies designed to strengthen and secure federal infrastructure in alignment with Executive Order 13834, Efficient Federal Operations. It’s an event for do’ers; where case studies are used to demonstrate overcoming barriers and where cost-effective solutions are shared for replication, including how to effectively invest in energy and water efficiency measures by leveraging public-private partnerships. A platform for agency leadership engagement to outline priorities and provide policy updates. Opportunities for agencies to coordinate and collaborate across federal government on integrated portfolio planning, cost-effective operations, and advanced technologies. The ability to obtain future-focused accredited training for continuing education, professional certification retention, and career development. There’s no denying that BEAR will be an ever-present theme at this year’s Energy Exchange. 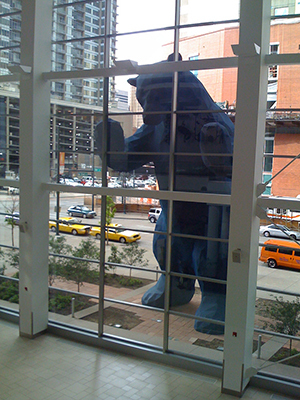 It’s also nearly impossible to miss the giant blue bear sculpture peering into the Colorado Convention Center. Installed in 2005, the forty foot tall, eye-catching sculpture by the late Denver-area artist Lawrence Argent is an iconic city landmark. Make tracks to attend Energy Exchange 2019. Download the Fact sheet or visit the Energy Exchange 2019 website to register and learn more.